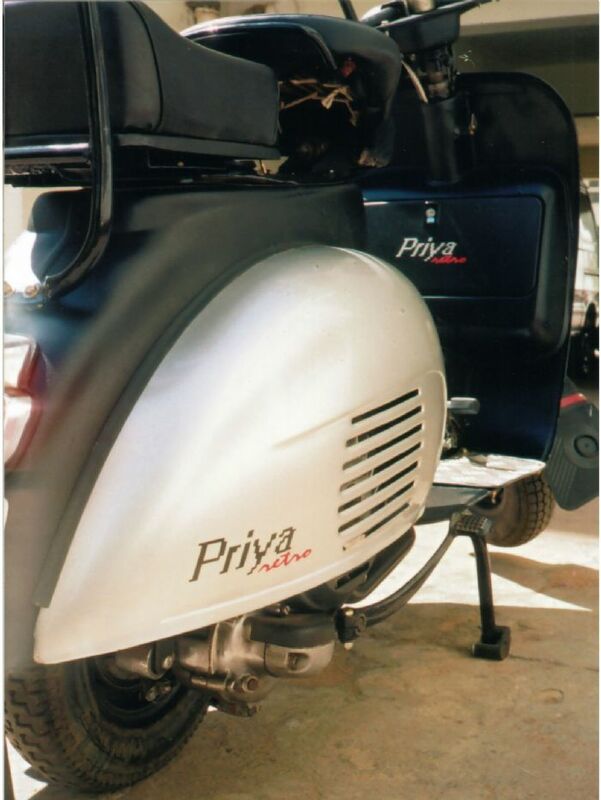 The Bajaj Priya was a three geared scooter manufactured by Maharashtra Scooters under a license agreement with Bajaj Auto from 1975. The design was very similar to that of the earlier "Bajaj 150" model which was in turn based upon a Vespa 150 (VBA type) with a slightly modified body. Vespa 150 (basically a VBA) had a fully enclosed, crested headset which could accommodate a clamshell Veglia speedometer. This was later replaced by a holding mount which enabled it to hold the Bajaj type round speedometer (only on Indian models). Later on the holding mount and crest were done away with so the round speedo could be directly fitted to the headset. All these headsets had the removable aluminium switch support of the VBA. Bajaj 150 had this same headset (that of later Vespa 150s). Bajaj Priya shared the same headset as the more common "Bajaj super" and also fitted a round speedometer, which was not fully enclosed for easy access to cables. The switch support was integral to the handle, unlike the VBA where it was joined separately. The vespa 150 (arguably always) sported the original Italian horncast with the older square Piaggio monogram. With the Bajaj 150 this changed to the horncast from later Vespa models (sprint/super) and held a hexagonal bajaj monogram (same shape as the newer Piaggio monogram). This horncast continued for the Priya as well. The earliest Italian part vespa 150s assembled in India had aluminium tail lamps of the VBA/GS150 design. These were later produced in plastic to lower costs.The Bajaj 150 always came with a plastic tail lamp as well. 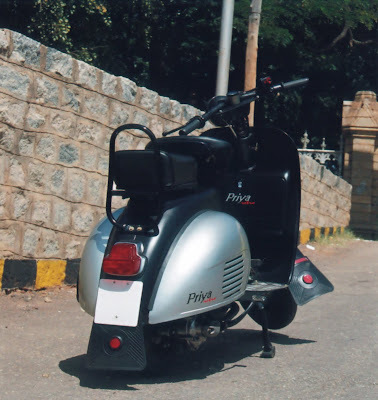 The Bajaj Priya came with a chrome or black powdercoat sprint type taillight. With the Bajaj 150, the choke lever changed position from above the petrol knob to adjacent to it. i saw ur scooter in u tube....nice work.